MNTaxa is the MNDNR's list of the vascular plant species that have been documented in Minnesota. For each taxon listed, MNTaxa provides full scientific name, including family, genus, species, and variety or subspecies (when applicable). Other attributes available include: whether the species is introduced to Minnesota; current status according to Minnesota's Endangered Species Statute and associated Rules; physiognomy; and the counties and subcounties (220 kb) in which the species has been documented. 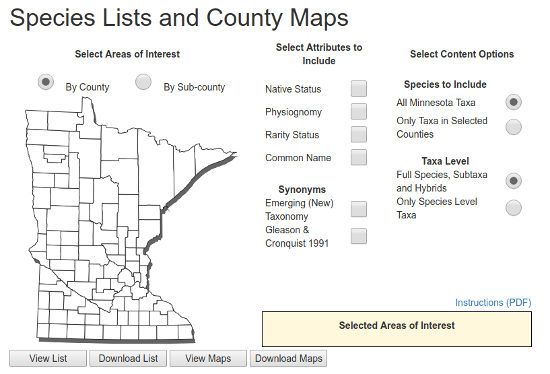 MNTaxa is used by the MNDNR to organize data in various plant and vegetation databases and to generate regional or county checklists for survey work, projects, and reports. The scientific names in MNTaxa are based on the published volumes of "Flora of North America North of Mexico", (Flora of North America Editorial Committee, 1993–, Oxford University Press, New York). For species not yet published by FNA, nomenclature follows that of Gleason & Cronquist's "Manual of Vascular Plants of Northeastern United States and Adjacent Canada". There are a few exceptions to this convention for some woody species and some rare species. These maps reflect vouchered specimens present in herbarium collections at the University of Minnesota Herbarium, a division of the Bell Museum of Natural History on the St. Paul campus, and select plant families (Cyperaceae, Orchidaceae, and ferns) from the Olga Lakela Herbarium at University of Minnesota Duluth. You can now create your own reports (checklists and distribution maps), or download a basic, preformatted checklist (as MS Excel file or a pdf file ). The preformatted checklist contains a list of all native and naturalized vascular plants that occur in the state, by scientific name. Family, common name, physiognomy, native status, state listed status, and noxious weed status, are also included. It is current as of November 2013. Select counties of interest and select attributes to put in your checklist. View or download your checklist in a spreadsheet format. View or download maps as well. More detailed instructions are available. Major changes to nomenclature are current as of May 2011, after Flora of North America Volume 7 was published. An interactive, searchable database of plant species used in wetland and lakeshore restorations is available from the Native Plant Encyclopedia of Restore Your Shore. For more specific data on individual rare species (those with a listing under 'state status') consult the Rare Species Guide. Plants listed as Threatened or Endangered may not be collected or planted without a permit from the MnDNR, Ecological and Water Resources Division. As programming develops, look forward to an updated website, which will allow users to query and interact with the data, and download portions, or all, of the data, in various formats. The new website will include a GIS-based interface, and the options to download plant lists by region, Ecological Classification System (ECS) categories, and more!